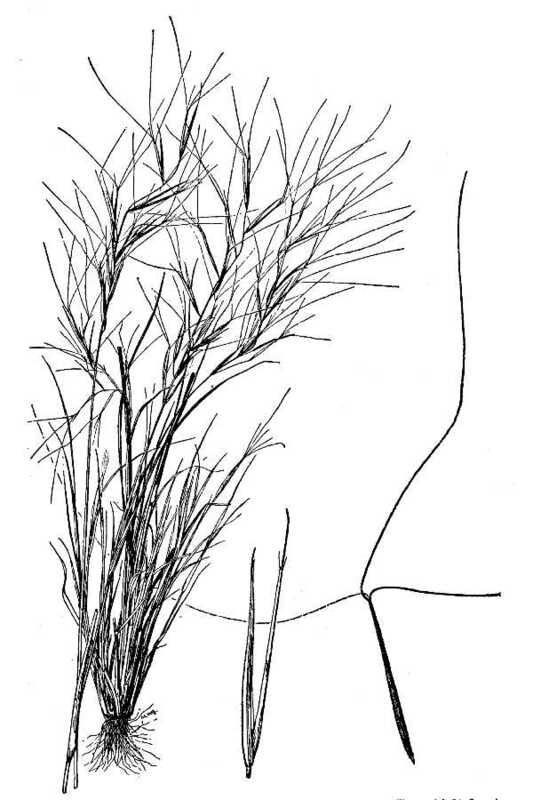 Aristida oligantha.USDA-NRCS PLANTS Database.Hitchcock, A.S. (rev. A. Chase). 1950. Manual of the grasses of the United States. USDA Miscellaneous Publication No. 200. Washington, DC (Accessed 5/2014). Aristida oligantha is an annual C4 grass, 20-40 cm tall, pale green, wispy, loosely tufted, branching from most nodes. Leaves 0.1 cm wide, tapered to a thread-like point. Flower spikelets 1-flowered, single or in pairs, linear, 1st glume 3 or 5-veined, short-awned, 0.1-0.3 cm, second 1-veined, slightly shorter, lemma 1.0-1.8 cm, 3-awned, awns divergent, 4-7 cm, terminal inflorescence few flowered; blooming and fruiting Aug-0ct. Habitat: Dry, open areas, sandy soil.